The Yoga Culture: 7 Simple Truths of My Very First Yoga Retreat.. — Hello Adventure Co.
7 Simple Truths of My Very First Yoga Retreat.. I remember how I used to hear about influencers posting about yoga retreats and just shrug my shoulders, thinking it just wouldn’t be worth it—why spend the money when I can just do yoga at home, and create relationships with the local community? While I am sure many people skip out for those reasons, after my experience I am almost positive that the yoga retreat experience was so much more than I could have ever anticipated or imagined for myself. Let’s put this out here: I RECOMMEND YOGA RETREATS TO ANYONE AND EVERYONE. Lucky for you and I, they are not hard to find these days! Yoga retreats are everywhere going on at any time of year. Pretty amazing. I am currently signed up for three yoga retreats for 2019. Morocco, Bali, and the Phillipines. I really don’t feel like I can get enough. This experience was so rich that I am beyond excited to embark on more of them. My first experience was through my lovely friend @Kaylala88 and her non-profit organization @Glowyogaretreats. My first retreat was in Bali—and it one of the greatest experiences of my life to date. We all connected so unbelievably well and was one of my favorite parts about the retreat—the life-long friends I made. Since then, I have had COUNTLESS people reach out to me asking me about my experience and if they should sign up. And my answer is do it. So, while you are possibly considering if this experience is right for you, here are 7 simple truths that I think come along with yoga retreats and what you should expect to find while you’re on this transforming week long journey with yourself and with others..
ALL OF THE EMOTIONS. Just let them come. Welcome them and don’t hold back. What you put in is what you will get out of the retreat. There were so many great conversations, breaking the ice activities, and deep chats that just allowed all of us to become so close so quickly. They’re coming and they will stay for the whole retreat. But this is a good thing! It was one of my most valuable experiences that I took along with me. When I first signed up for a yoga retreat the last thing I expected was that I would be unleashing so many different emotions within myself and crying so many happy tears with women I just met two hours ago that already felt like my sisters. Emotions can be scary but here they were my best freaking friend. Okay, we all know the stereotypes of Vegan food tasting like cardboard. I know. Most of the time these days yoga retreats have all vegan food for the yogi’s for the week. A lot of my friends that I went with were worried about this, because well—they aren’t vegan! And that’s totally okay. These friends of mine (including myself) were all so surprised at how tasty the food was the entire retreat!! The meals were creative and fresh everyday. Sayuri Tanaka is a vegan and raw restaurant in Ubud that supplied our meals for the retreat in Bali last August. (Be sure to check out their Instagram too!) The meals are incredible and very filling. The only thing I will say is that I definitely needed some extra snacks throughout the day—but that’s to be expected. Don’t knock the vegan food until to try it out! You actually might be really surprised at how flavorful the meals can be! I have to admit—at the time, I was going through a really hard time with an ex-boyfriend who had just relapsed before I left for my month-long venture to Indonesia. I felt weak, sad, emotional, and a little lost when I was arriving to the retreat. But when I left to come back home, I literally have never felt stronger and more prepared to tackle life. I had a lot of BS that I had to deal with when arriving home and even when things in my personal life took a turn for the worst, it seemed like the retreat happened at the perfect time. It gave me so many tools, resources, friends, and experiences that I used to help me cope and get through some of the hardest times when I got back home. So for anyone who may be going through a tough time, these retreats really can show you how strong you are and that you can get through anything will the help of other people and some self-exploration. I don’t know about you, but meditating is so hard for me! and Savasana? How do people say it’s their favorite pose?! It is actually my HARDEST pose (heavy eye roll). Sitting still has always been difficult for me and my anxiety kicks in full throttle. I need to keep my thoughts from racing and focus on my breath? Yeah—right. Because meditating was always so difficult for me, I did it the least—and I wasn’t ever the one to push myself to practice it much either. This retreat stripped that barrier away layer by layer. It taught me how to be comfortable being alone and finding the perfect balance between spending time by myself and being in a group of people. We practiced a lot of meditation together and it was so helpful. One of my favorite humans, Cait, @Sunburntandsalty, aka meditation queen, really helped me dig deeper into myself and helped me figure out how to meditate properly, how to focus on my breath, and how to make progress slowly but surely. Such a rewarding feeling. Now, I meditate about once a week! This is probably the most frequently asked question by my friends and anyone interested in joining the retreats. “I’m not any good at yoga.” “I have never practiced yoga, I have only been to two classes in my entire life”. PERFECT. EVEN BETTER. YOU HAVE THE MOST TO GAIN! There were three other girls who were on the retreat that I went on that had never practiced and the other two girls had only been to a couple classes before, not knowing much of anything of the yoga world. And they came alone! How badass is that? Anyways, the point is—you don’t have to be advanced or even a dedicated yogi to reap the benefits from a yoga retreat. You will most likely learn the most out of the group and take away so many new tools. Who knows, maybe you’ll even be inspired to become a yoga instructor yourself after the week is over! 6. Came with Two Friends, Left with Ten. Probably my favorite part of the retreat was meeting so many cool women. And then staying connected to them a year later. Seriously, THAT IS SO RAD. 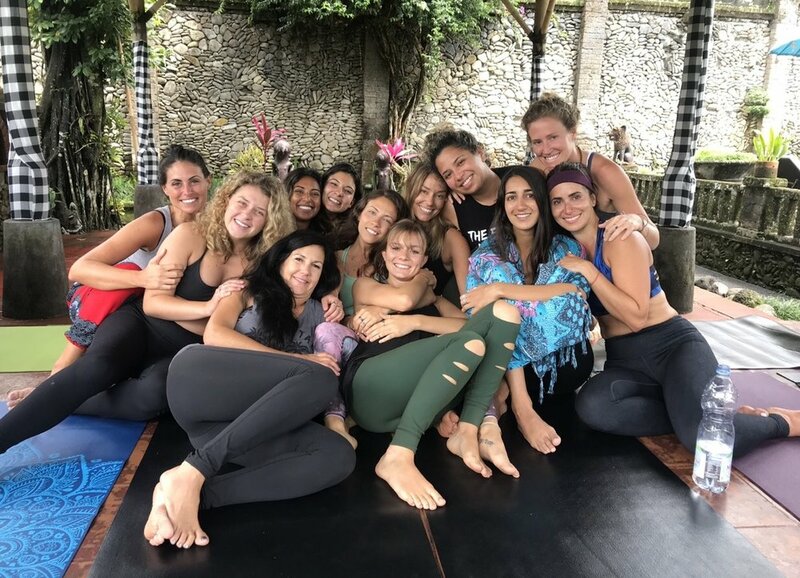 At least with my experience with Glow Yoga Retreats, the way the retreat was laid out and all of the activities we did throughout the week really created a family atmosphere. We ate breakfast together, practiced yoga together, had lunch and dinner together… and maybe a couple crazy nights in the resort with some alcohol and unhealthy snacks. It’s all about balance right? @Kaylala88’s retreat felt so free because we were able to do whatever we wanted with the retreat time. If you didn’t want to go to a class you didn’t have to. 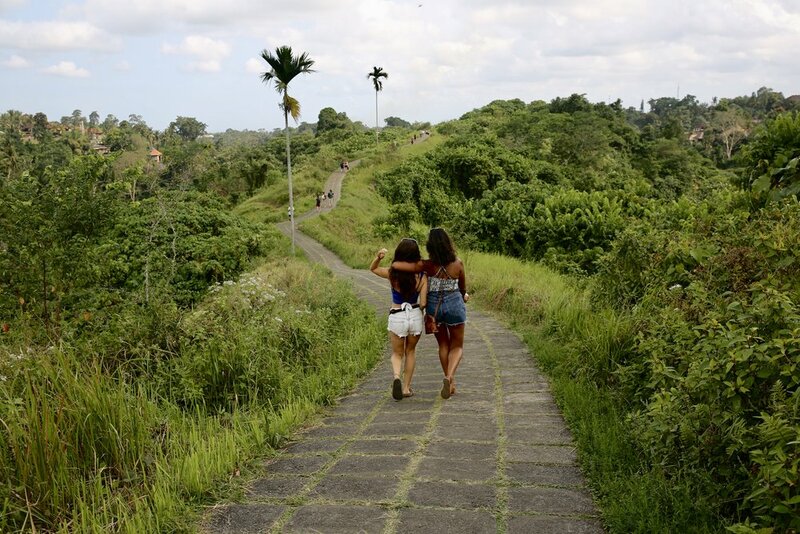 All the girls decided one day that we wanted to check out a place in downtown Ubud, Bali instead. We had some coffee at a plantation together and visited a sacred water temple. We spent so much time together on and off our mats. We shared a lot of stories and we were all there for a reason coming from all over the world to bond over yoga and the culture of yoga. I am so thankful to this day that I met those incredible free spirits and can call them my girls today. Going off of the relationships that were built over the course of just a week together—transformation on and off the mat is hard to avoid at a yoga retreat. I actually felt like a different person when I returned. In the best of ways. Transformation within my character, self-esteem, clarity, lifestyle, my approach to situations and life for that matter. New habits were instilled in me and new routines that I can’t see myself living without now. It is a really powerful thing to see your transformation within your yoga practice and breakthroughs on the mat translate into breakthroughs within your life. How cool is it to take away so many positive things from just a week of spending time getting to know yourself and reTREATing yourself. You deserve it. So here’s my final advice—If you’re considering signing up for a yoga retreat. Just do it. Don’t wait. Buy the ticket and plan the rest later. You won’t regret it.